The Japanese influences of the 1870s and 1880s came to silver in many forms. The bright-cut designs of the period utilized such elements as flowers, leaves, birds, and branches found in Japanese textiles, but as in 'Chrysanthemum' (introduced 1885), their asymmetrical dispositions were constrained by the Old English forms into which they were cut. Acid etching is the background of the handles into which the flowers are incised and emphasizes the flowers, branches and leaves. There is very, very slight softening to the surface, but the etching is still present and the bright-cutting strong. Tine wear is minimal, and the overall condition is quite good with no scratches, bends or burrs. The forks are 7.5 in. 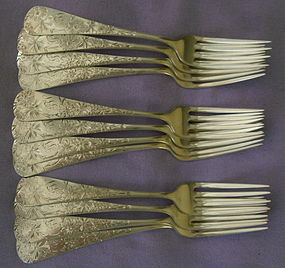 long and their total weight is 588 g. They have the Gorham logo, a mark which may indicate 1889 as their date of manufacture, and a script monogram GTS on the front.